Angie Huber, a lanky 16-year-old sophomore, sheepishly admits that she has texted during school. Huber's long brown hair is tied in a bun at the back of her neck, and she's lacing up her tap shoes getting ready for her after school dance class. Other teens in the studio huddle around an iPhone looking at pictures from the previous weekend; another is doing homework on her laptop. Huber estimates roughly half of her classmates at Summit High School have smartphones. She has her own cellphone and an iPad at home that her mother, Christine, says she uses for downloading books and watching YouTube videos. There used to be large signs in common areas at Summit High—cellphones with red crosses through them—but over the last two years, the sings have slowly disappeared and, this week, Huber and her classmates will add a school endorsed device to their technological repertoire, an iPad tablet, one for each of the nearly 1,200 students. "I'm pretty excited," Huber said with a smile. "It's cool that everyone gets the same thing. It's going to make things easier with research and homework and communication." Students today are widely considered to be "digital natives," a term coined by educational technologies researcher Marc Prensky in 2001 that refers to students raised in a time when there is no divide between technology and daily life. According to the Pew Research Center, one in three high school students carry a smartphone in their pocket and teens send an average of 60 text messages daily. Yet, in spite of this everyday comfort and technological reliance, there remains a large gap between the use of technology in personal life and classroom instruction. This month, the Bend-La Pine School District will try to close that gap when it takes a giant leap away from the clutter of textbooks and chalk dust, and into the digital age by launching an iPad pilot program. "Our biggest thing is to try to close the digital divide," said Shay Mikalson, executive director of curriculum and instructional technology for the Bend-La Pine School District. "Our district looks at this not as a tech project, it's a teaching and learning project." The Bend-La Pine School District is not necessarily on the cutting edge of curriculum reform, but it is certainly part of a wave of early adopters. Over the past decade, such digital conversion programs have been implemented in urban school districts like Chicago and Los Angeles, places that are burdened with much higher poverty rates and, consequently, greater digital divides between the haves and have-nots. The Coachella Valley Unified District—a high poverty district southeast of Los Angeles—just rolled out iPads for every student, pre-kindergarten through high school, amid concerns about security and uneven hi-speed Internet connectivity across the district. Even in a time of tight budgets, school districts have calculated—and justified—the cost of supplying students with laptops and iPads by pointing out the savings from eliminating pricey items like textbooks and paper printing costs. Moreover, in the Bend-La Pine School District, thanks to nearly $400,000 in donations from local businesses, the pilot program will be able to provide iPads to some 3,500 students. Starting next week, Summit High School will be distributing personal devices to every student, while Mountain View has already distributed iPads to its entire freshman class. Later this month, area elementary schools—High Lakes, Juniper, Rosland, Buckingham, and Lava Ridge—will also join the hi-tech fray, providing iPads for students as young as third graders. 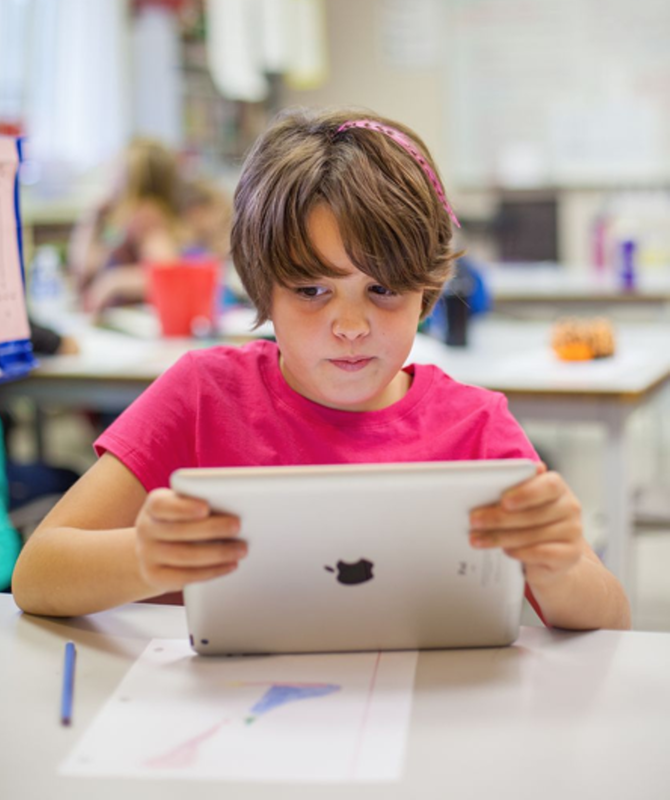 The district plans to spend $379 on each iPad, and $90 per student for digital content. Summit Principal Alice Dewittie said that this kind of technology upgrade in the classroom is long overdue. "There's a change in the world," said Dewittie, adding, "access to information is near instantaneous. I'm not saying memorizing the 50 state capitals is bad, but about as fast as I could remember them I could look it up on Google and tell you the elevation, population and all kinds of stuff about those capitals. It isn't what you know anymore it's what you do with what you know. We have the Internet and technology, which has impacted education barely at all, we deliver instruction the same way we have for the last millennia. That is something we should be rethinking." With 83 percent of Summit graduates bound for college, Dewittie also sees the 1:1 iPad program as a way to be sure all students are prepared for the increasing technological expectations of college. According to a study conducted by the Babson Survey Research Group, more than 6.7 million students—or one third of those enrolled in higher education—took at least one online class in the fall of 2011. The same study found 69 percent of schools continue to move in the direction of online learning, stating that it is a critical part of the future of program development. With educational software like Blackboard and Moodle—where students can collaborate using online discussion boards, review curriculum and turn in assignments—it is becoming decreasingly common to hand in a physical printed essay or assignment to a professor, many just ask students to submit online. Even if students aren't on their way to more school after graduation, almost all occupations now require some form of digital literacy. Georgetown University's Projections of Jobs and Education Requirements through 2018 claims that even high school dropouts who use technology at work earn 15 percent more than those who do not—college graduates who use technology earn nearly 23 percent more than their tech-free counterparts. "[Universities] have massive assumptions about digital readiness," said Dewittie. "They assume they all understand the difference between good sources and bad sources and know how to turn work in online." She continued, "The world's equalizers now are access and the ability to use technology and if you don't have it, I don't even know if you're in the conversation. There isn't anything out there for kids if they can't navigate a digital world." It is hard to tell exactly how many schools across the country have overhauled their curriculum to insert more technology because the conversion from paper to iPad is happening in so many different forms. Apple confirmed in February that more than 1,200 K-12 schools use their technology in the classroom, and that iTunes U content, a free catalog of educational apps and information, had topped 1 billion downloads. Beyond tablets and educational apps, districts have also been incorporating laptop and iPod technologies into curriculum for over a decade. Although there aren't firm numbers on how far this revolution is reaching, Dr. Mark Edwards has perhaps one of the best handles on the scope—and validity—of digital conversion in schools. Edwards, who received the 2013 American Association of School Administrators National Superintendent of the Year based on his Mooresville, NC district's six-year-strong conversion initiative, is perhaps the country's leading expert on digital conversion. He has also published a forward-thinking tech guide, "Every Child, Every Day: A Digital Conversion Model for Student Achievement," the very text on which the Bend-La Pine School District has based it's pilot program. The Mooresville School District is particularly applicable as a blueprint for Bend-La Pine. In terms of dollars spent per student, the Mooresville district ranks a lowly 100 out of 115 districts in North Carolina, yet is an impressive second in graduation rates and third in test scores across the state. Such success rates, Edwards explained to the Source, serve as a strong argument that it is not how much is spent per student that matters, but how it is spent. Likewise, Oregon is ranked 32nd at the state level in per student spending. Reassigning funding for traditional paper learning models and textbooks to a technology-based future in the classroom—if done well—could save school districts big bucks down the road. "We are now 90-95 percent digital," Edwards said about his school district. "Most of our encyclopedias in our libraries have never been opened, and it's because every student has access to an encyclopedia, and more at their desk." Edwards said his district has had educational administrators visit from as far as Japan to see the success the of Mooresville program in action. "This effort with digital resources aligns with students' future, not our past. It makes huge sense," said Edwards. "If I went to the doctor and he said, 'Let me go get my medical book and see about this,' I would run out of there. Any occupation today is relying on technological resources. It's important that our teachers are equipped with future-ready resources instead of the resources of the past. It's been transformative." And there are success stories even closer to Central Oregon that provide optimism about what digitizing school curriculum can do. The Canby School District, located just south of Portland, has been running a successful technology campaign since 2007, when the district introduced iPod Touch in third grade classrooms. "Subject areas change so much we're not able to keep up with them with traditional paper curriculum," said Joseph Morelock, technical director the for Canby School District. "That ship has sailed." Morelock also echoed the financial benefits of a digital classroom. "If you think about how many tools we're able to replace—a dictionary, a calculator, an Internet browser, a globe, a text book," added Morelock, "there is a cost efficiency when you provide every student with this level of resource." When you think of the iPad as a high, multi-functioning tool, it's a no brainer for classroom use. But how can educators change the perception of these devices for students, many of whom have iPads at home and use them primarily for YouTubing Miley Cyrus videos and updating their Twitter feeds? Teaching students how to be responsible digital citizens when they have a web browser at their desk is all a part of the challenge said Morelock. "It's the new civics," he said. "Our central purpose in school is to educate. Our mission is about helping students make good, safe choices when they are or are not on school grounds," Morelock continued. "On a personal device the whole world is open to them, this is why we're engaging parents to help make students make good choices when no one is looking." Even more troubling for critics of the digital programs is the fact that tech savvy students sometimes know more about the devices than teachers and programmers, bulldozing through firewalls and security access to games, social media and the wide world of the unfiltered Internet on their school issued devices. Just last month, the media fluttered with the arguable failure of a billion dollar tablet program launched in the Los Angles Unified School Districts where students easily hacked the schools' lack-luster security and were able to access non-school sanctioned sites like YouTube and Facebook on their iPads. The reaction to the hacking was a temporary shut down of the program, until the district could better control the settings of the devices, or their students, it's not clear which. Summit Principal Dewittie takes a boys-will-be-boys approach to hacking concerns. "I fully expect them to hack our software and get around our firewalls, that's what kids do," said Dewittie. "If you went into a teacher's grade book and erased a grade, that was wrong and doing it with your iPad is wrong, too. We will turn it into a learning experience. The job of a pilot school is to blaze through as much of this stuff as we can." In Central Oregon, each student issued a device was required to sign an acceptable use agreement for their iPad, sparking uncharted, but important conversations between students, educators and parents about Internet usage and digital responsibility. Teachers received devices over the summer and students at Summit were required to spend a week learning how to use the device, which comes equipped with security that blocks social media sites and inappropriate content. A new army of digitally armed teens isn't without its concerns, but there's no way to put the genie back into the bottle. The Internet isn't going away and there's no denying it is an extremely powerful educational tool. The next generation of students may never hear the screech of chalk on a chalkboard, they won't have the joy of dog-earing the pages of their schoolbooks and they won't be able to tell their teacher that the dog ate their homework. In exchange for those vintages is instant access to an exponentially growing library of information, the ability to carry Shakespeare's unabridged collection in their pocket, and, hopefully, a lesson in how to use these commanding technologies appropriately. Other concerns are that the iPads are just a shiny toy for students, increased screen time for younger children, and the seemingly decreasing role of teachers in the educational process when a tablet is present. "We're not trying to make our jobs obsolete," said Matt Johnson, one Summit High School math teacher who has, with other teachers like Brandon Thompson, uploaded his course outlines and materials to the iPad software. "It's not telling [students] how to think about the math or interact, but instead of handouts or writing on the board, they have access to the lesson all in their lap." "We're thrilled," added Thompson. "It feels like finally, what's happening in schools is keeping up with the technology students have at home. The schools should really be ahead of that."